Evaluated by Kurt Eifling, MD, Washington University in St. Louis School of Medicine resident, Zachary Hafez, MD, Washington University in St. Louis School of Medicine resident, Jason Wagner, Assistant Residency Program Director, Assistant Professor Washington University in St. Louis School of Medicine, faculty member. Since starting my career in emergency medicine, the trauma shear has been emblematic of our role at the point where people change from regular community members and become patients. They arrive unstable, traumatized, scared, and almost always clothed. Yet before we can change them to resuscitated, collected, and reassured, they must also become naked. The need to make people immediately naked is unique to our specialty, and the devices we use for that daily purpose are just as ubiquitous as stethoscopes and smart phones. Shears are everywhere, but does that mean they are the best tool for this every-day job? Other industries that have faced the same question, ”what’s the safest, fastest way to make this one piece of fabric into two pieces?” do not elect a scissor-type design. Escaping from an entangled seatbelt in the US Marine Corps, for example, is typically done with a horseshoe-shaped blade on a single-piece tang, such as this one made by Benchmade. As devices intended for self-rescue, these are often Spartan in design and not designed for daily carry or comfortable use with the ungloved hand. Most products designed for rapidly cutting fabric in an emergency agree that the operator is advantaged most by pulling a blade closer; not by pushing a scissor away. The S-Cut is a Swedish product that combines the safe hand-feel of our familiar trauma shears with the strap-cutting approach of a pulled blade, making nakedness happen more rapidly and safely than ever before. Though originally designed for equestrian and veterinary applications to cut straps, cords, and ropes quickly and safely, first-responders have adopted this device in Europe. We tested the S-Cut QE (short for ”quick and easy”) as a way of making clothed people into naked patients in our level-one trauma center in urban St. Louis. The experience of using the S-Cut QE in the clinical setting is overall excellent. The first time I used this device, I was amazed at how quickly and effortlessly it laid open a pair of denim jeans and the patient’s belt. Moreover, I was certain I would not have the shears open and nip the patient’s skin folds nor any one of the providers’ dozen hands darting all over the patient’s body. It glided neatly through multiple layers of clothing, leather belts, and synthetic boots. It was not tested specifically on cutting through a metallic zipper, but traversing the zipper is not necessary when a flick of the wrist gets you to the waistband instead. The S-Cut QE fits neatly into a lab coat pocket, has a tether point for a lanyard, and it weighs no more than shears. It also performs well taking down bulky gauze dressings with the patient’s skin feeling a smooth plastic anvil instead of the blunted steel blade of traditional shears. The only drawback I found was my own anxiety in having something so exquisitely sharp in my pocket during shifts. I feared I would jam my own hand thoughtlessly into my lab coat pocket and onto the light-saber blade, but this anxiety proved to be unfounded in my case. The mouth of the cutting area is narrow enough, and the protective anvil broad enough, that to insert one’s finger the device would be difficult to achieve deliberately, and even harder by accident. A holster is available. In professional kitchens, it is considered common knowledge that part of knife safety is keeping your knives very sharp. A blade sliding easily through a medium will not tempt the user to press or mash into the act of cutting with force that is difficult to control. If you like your scalpels sharp, you’re cutting easy, and your trauma patients exposed, then the S-Cut QE may be just the upgrade you need from traditional shears. Använde S-CUT för första gången häromnatten, nu längtar jag tills nästa trauma! Mitt val är klart! S-CUT-4-Life! I have used internationally branded clothes cutters for years but none of them compare to the ”S-Cut”. I no longer need to carry trauma shears. The ‘S-CUT’ does it all. Bullet-proof when you need it! The S-Cut Swedish Cutter is a premium grade European-engineered cutting instrument, with an innovative circular blade. It just cuts and cuts, with a safe and secure recessed blade that can make short work of even the heaviest fabrics. The rotating numbered dial allows you to easily rotate to a fresh cutting edge with a twist on the dial. A rotary blade is many times more useful than any straight edge blade can possibly be. When you are finally done with the circular blade, you can easily replace it with a fresh one. If I did racecar track work, or was on a light rescue unit serving a major high speed interstate, the S-Cut might be on my short list of new basic essentials. It is a high-performance, rugged hand tool with serious cutting power. A patient was lying in the middle of the road after a motorcycle accident. When I arrived, EMS was on the scene fighting with the old standard trusty ”trauma shears” to remove the patient’s thick and heavy sweatshirt. I retrieved the S-CUT and in a total of three smooth sweeping motions, I opened the front of the sweatshirt as well as the sleeves. In a matter of seconds I had the patient’s body exposed from the waist up. He also wore heavy jeans that are always hard on the fingers with the trauma shears; however the jeans were easily cut and removed with the S-CUT. This has to be the absolute best cutting device I have ever used in my 20 years as an EMS provider! Jag kan inte tänka mig att sluta använda S-CUT och gå över till sax igen. S-CUT har förändrat möjligheterna att, med kemskyddsdräkt, snabbt ta av kläderna på drabbade vid personsanering. Det går, till skillnad mot saxar, lika bra oavsett om man är höger eller vänsterhänt. Det är också möjligt att skära t ex RB 90 eller motsvarande, vilket är unikt. S-CUT är ett lysande exempel på en säkerhetsfråga, i synnerhet inom iroadracing och speedway där de har heltäckande kläder, men även andra grenar som har hårda skyddskläder. Tycker att den är ypperligt lätt, smidig, ingen risk i att ”klippa” i patienten. Har inte varit med om några nackdelar. De viktigaste fördelarna med S-CUT är snabbheten och att den är enkel att använda. Det ger förutsättningar för att den fungerar även i enkla och krävande miljöer. Efter att provat S-CUT prehospitalt samt inne i sjukhusmiljö har vi funnit den lätt att hantera, effektiv, säker både för patient samt användare. S-CUT kommer att finnas i vår personliga utrustning, när vi representerar Sverige i losstagnings-VM i Kapstaden, Sydafrika i oktober 2006. Akutmottagningen på Sahlgrenska universitetssjukhuset har använt S-CUT i över ett år. Vi har noterat att tiden det tar att ta av kläderna på motorcyklister med skyddskläder kan kortas avsevärt, ibland upp till fem minuter snabbare än tidigare. Har patienten bomullskläder så tar det någon eller några minuter kortare tid att ta av kläderna, jämfört med saxar som vi använde förut. 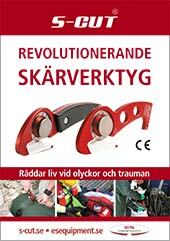 Vid frakturer är det väldigt smidigt då man inte behöver röra patientens armar eller ben för att öppna upp kläderna. Av de verktyg vi provat här på akuten så har S-CUT visat sig var den bästa. Om man vill korta ner handläggningstiden på akutrummet, så rekommenderar jag S-CUT. Vi på Akutmottagningen i Karlstad har via olika projekt redan från början bidragit i utvecklingen av S-CUT – dels för idéutveckling, dels för praktiska tester. Resultatet motsvarar våra högt ställda förväntningar och S-CUT används nu i den dagliga verksamheten. When you need to expose, you need to expose properly, not to the limit of your kit. S-CUT has no limits- it is a quality emergency cutting tool that cuts through any item of clothing. S-CUT används av oss på Räddningstjänsten Karlstadregionen som ett säkert, snabbt och effektivt hjälpmedel främst för friläggning av stolpar, laddningar m m vid losstagning. Dess utformning medför ett säkert handhavande i stressade situationer både för användare och den drabbade. Läs vår nya broschyr med de CE-märkta produkterna. Detta blad är under omarbetning och läggs ut så snart det är klart.